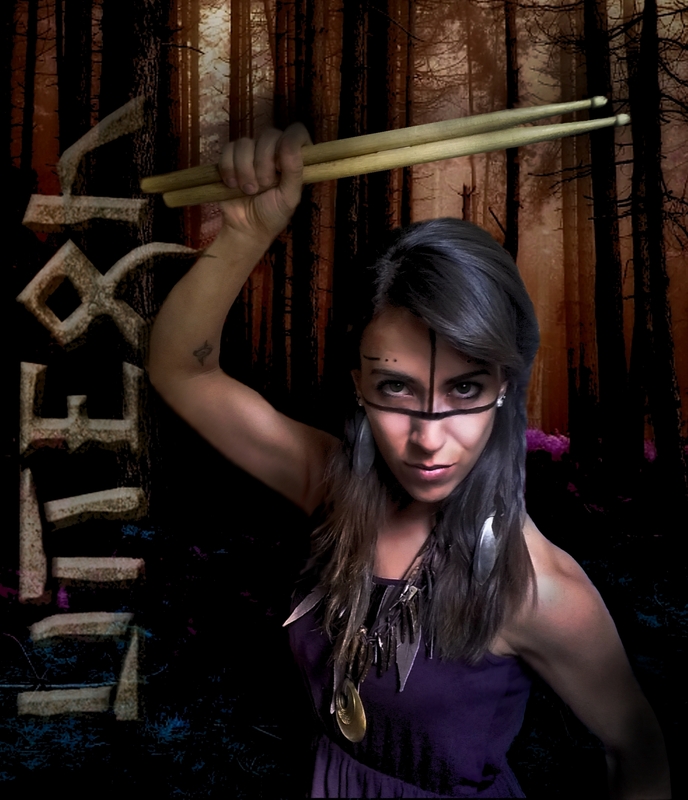 UTTERN is a unique band in the Italian and European scene, combining power and femininity in an explosive mix of pagan-shamanic music. 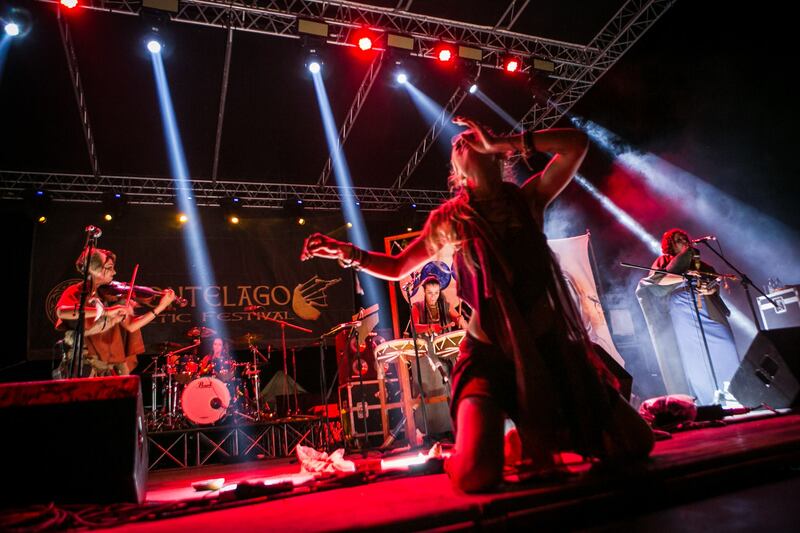 In a few years they have gained the attention and the affection of thousands of fans, playing in the greatest Italian Celtic music festivals such as MONTELAGO CELTIC FESTIVAL, MONTERENZIO CELTICA, BUNDAN CELTIC FESTIVAL, TRISKELL and many others. Their success come up from the genuine connection with the sacred feminine, the Divine Mother and the ancient feeling of Pagan Europe, which the audience lives and makes vibrate within itself in every show. Their concert is a great musical ritual, where the water-fire-earth-air elements join the fifth, the Spirit. Music, sacredness and dance become one, sometimes vortical, sometimes mystical, with the aim of celebrating Life in all its fullness. Their first and long awaited EP was released on September 21st 2018, with excellent results: in the first month “Gudinna” comes in third place in the Amazon.it ranking of folk music and in just two months it exceeds 1000 plays on Spotify. 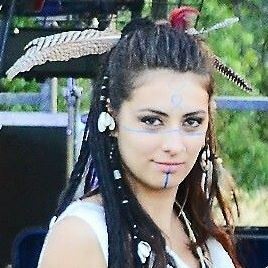 Denise is a female shaman of ancient European paganism. 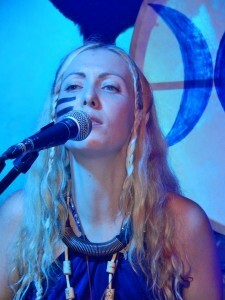 She is also the lead singer of the group “Uttern“, which is named after her tribal name in the Clan she belongs and for which she is spokeswoman. As a child, Denise displayed a spiritual awareness far beyond her years. Born into a family of non-practicing Christians, very early on she had memories of other times and places for which her family was unprepared. At the age of 13, however, when she relayed her memories to her family, they realized they were not fantasies and that she had gained awareness of past lives, which made sense of all the episodes that they had considered “abnormal” so far. By 14 she began to look for answers, both in a spiritual and scientific sense, starting with Christianity and then focusing her attention on other spiritual cultures. When she turned 18 she made her first trip to India, living in the monasteries of different religions, including ashram, or Hindu Shaiva. For a month she lived at Dharamshala (Dalai Lama’s current residence) and she also spent time with Andean shaman-priests in Peru, as well as with those from Native American traditions. She has travelled extensively around the world always searching for the truth, ready to give herself to it. In addition to the study of reincarnation with doctors and scientists of international fame, it was important for her to find the common thread that linked the brilliance of the special souls whom she met in every culture–masters and teachers of various religions and spirituality, from native Tibetan lamas to Franciscan and Andean shamans. 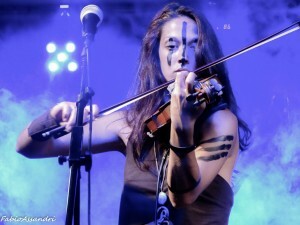 She earned a degree in Asian languages ​​and cultures in order to pursue this type of path, and over the years, she has worked on projects abroad in the field of music therapy, archaeoacustics, spiritual issues, emotional blocks and fears therapy. She also offers targeted counseling on overcoming religious conditioning and personal transformation, while respecting every spiritual path. Denise ultimately found her roots in the culture and spirituality of Old Europe, the land where she was born. They are ancient roots that strive for communion with the rhythms of nature, movements, the study of the cosmos, the evolution of harmony and soul-searching. 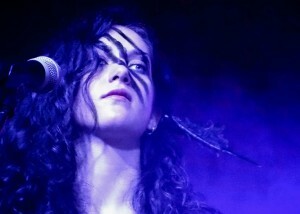 To her, music is not the protagonist but the expression of a profound spiritual feeling, innate in her since her birth. It is a wonderful means to transmit the vibration of the heart to others, because it touches the soul directly. 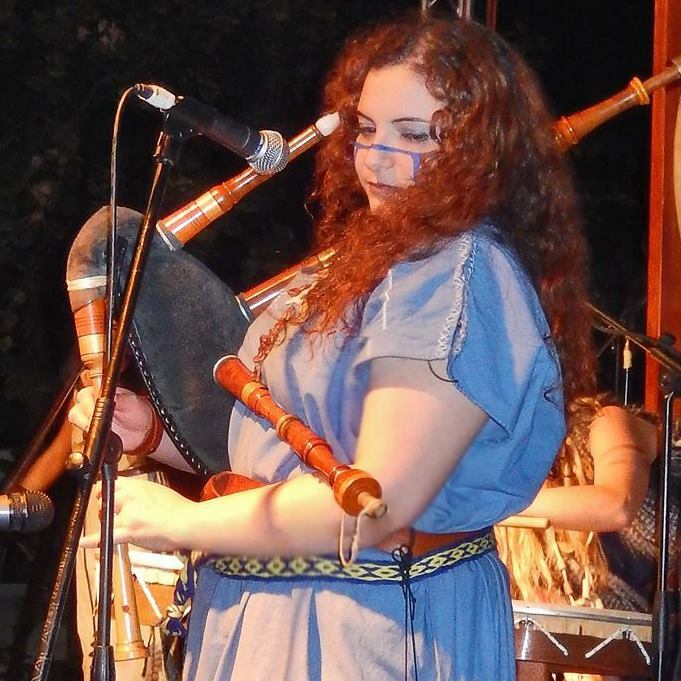 She also starred in “The Voice of Italy“, where she brought the testimony of Celtic music and culture and the spirituality of ancient Europe as it is expressed and experienced by different clans and tribes. Denise brought to TV what she really is and what she feels in her heart in order to raise awareness of a cultural and spiritual world that is mostly unknown to the general public. In her performance she sang Scarborough Fair, which was seen by over 5 million viewers and within days her video on Youtube has received over 100,000 views, far exceeding the performance videos of other competitors. 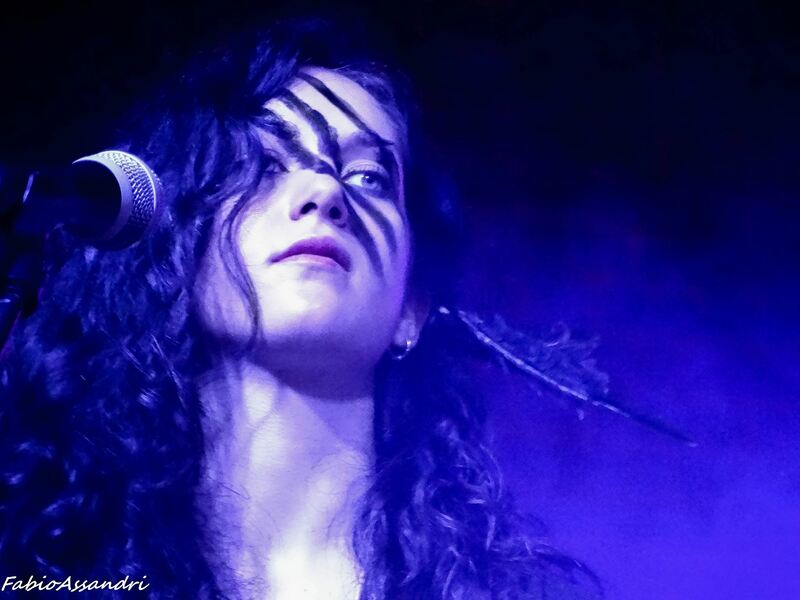 After leaving “The Voice of Italy” program, she founded Uttern, where she fronts the band as lead singer and percussionist. Mascia is a key part of Uttern. She has been part of the Clan Lough Gur and collaborates with Denise to manage their concerts both from an organizational and spiritual perspective. This includes performances during full moons, solstices and equinoxes as well as interpreting spiritual paths through dance onstage. Mascia is a female shaman of ancient European pagan spirituality and was raised by a mother who passed on to her the teachings of nomadic cultures and Siberian shamanism. Using her training in naturopathy and dance as a means of personal catharsis, she also works with women groups on sacred feminine healing. She is the creator of “Moondance”, a reconnection route for female rhythms, which is linked not only to the lunar cycle but also to nutrition, the use of herbs, shamanic dance and expressive movement, which play an important role in the rediscovery of our ancestral nature. Her training in dance ranges from Arab dervishes, Indian Odissi, and Rajasthan to Persian dance; from folk dances of different European countries to dance theatre. She graduated in 2012 with a concentration in oriental dance disciplines and teaches various dance classes. 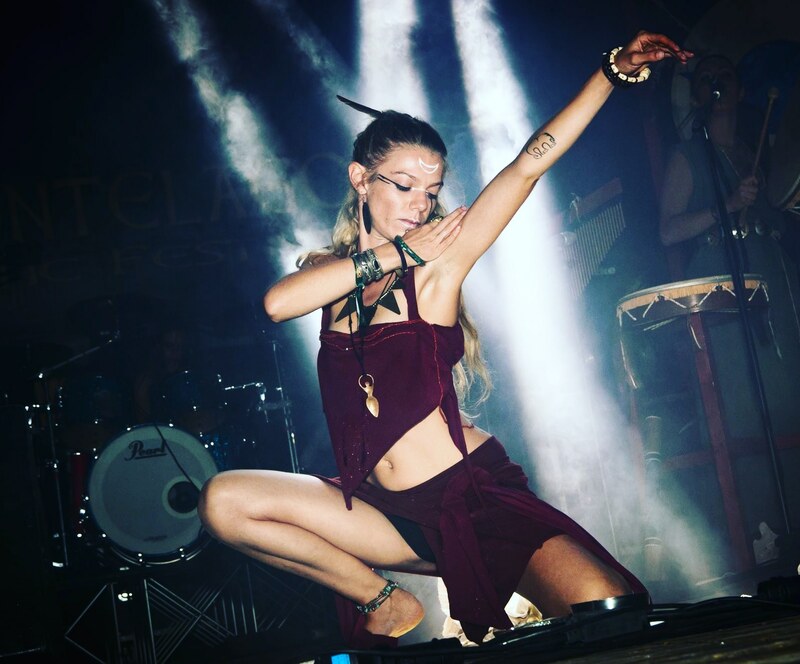 While performing with Uttern, she expresses her true essence on stage, channeling and manifesting herself through the Divine Feminine energy that is expressed through an instinctive and visceral dance. In addition, she accompanies the most important moments of the concert with blessings and thanks, making it a ritual in which she channels the spiritual strength linked to the ancient rhythms of the past. Grown up surrounded by nature and in a family of multi-ethnic origin, Deborah has developed since her early years great curiosity and desire for exploration. This research brings her to spend the days in contemplation of a tree or a river, rather than surround herself with the company of her peers. At the age of 16 she finds the answers to her feeling in some personal growth paths, such as family constellations, yoga and meditation. Then she puts to good use her linguistic knowledge (she is in fact graduated in foreign languages) traveling and living in different countries for some years. She finally decides to stop and return to her homeland. Thus began her biggest transformation: thanks to her mother and very close women began a profound journey on the Sacred Feminine, digging deep thanks to the method of the Family Constellations and slowly rediscovers a world of ceremonies, lunar cycles, equinoxes and solstices. So she recalls a sacrality that was known to her but that she had forgotten. In 2014, for the first time, she gave a disinterested service to Mata Amritanandamayi Devi, a global humanitarian and spiritual leader known as Amma. From that moment her heart is pervaded by the love of a great Mother and becomes her disciple. Rediscovering herself completely, she allows herself to rediscover her creativity: she starts painting again, takes part in spontaneous painting workshops, discovers the beauty of the body through dance, thus embarking on a path of biodanza. She tackles different paths of art therapy and thanks to the sining and the theater she finds her inner voice. She also enrolled in the Ritual Constellation Training at the Nemeton Institute with Dr. Marco Massignan and Elena dell’Orto. What better time to meet the Uttern? As soon as she is contacted she immediately feels “at home”, rediscovering the magic and beauty of creating between women and sisters. Her love for dance and that for nature and the spirits that are part of it blend perfectly into the essence of the Uttern, embellishing it not only with the dances, but also with the ceremonies and blessings that Deborah deals with before and during the concert. Deb has a multi-faceted and versatile personality and this makes her essential in Uttern, musically, artistically and spiritually. The story of her arrival is full of many coincidences and omens felt by other members before meeting her, so that she seems almost “predestined” to be part of Uttern. She has brought not only her ability to play the bagpipes and wind instruments and a singing voice with a wide vocal range, but also her personal shamanic path, which is expressed through her creations of ritual objects used during concerts. At the age of 11 she already understood that her destiny in life would be playing the pipes, even vowing to her parents that this would be her way in the years to come. Because bagpipes were scarce in the Venice area where she lived, she was forced to wait a few years to be able to commission the building of her first bagpipe. Once she received her instrument she promptly founded a Celtic-medieval music group consisting of bagpipes and drums, called the “Silvanus“, with which she still performs in various regions. In addition to bagpipes she also plays the flute, the sweet-alto flute, tin whistle, Selje floyte, didgeridoo and shamanic drums. Although her cultural background was of Christian origin, as a girl she started to deepen her study of many other types of spirituality, without closing herself in any belief or faith in particular. Because she has a rational and scientific mind, her approach to studying spirituality is based on the careful assessment of the authenticity of sensory experiences that relate to the spiritual world. Her studies have focused on Buddhism, Animism, Zoroastrianism, Sukyo Mahikari and shamanism, with particular emphasis on the Borealis. When she discovered Sami-Finnish shamanism she fell in love with a type of song called Yoik, which now she uses in some songs with Uttern. She founded a soul family in the musicians of Uttern, where all aspects of her inner world can show at their best, and the girls have found in her a true sister of ancient date. Violinist of Uttern, as a child she found in music a way to deeply express the many facets of her sensitive but strong personality. She is an identified character in the fire element and she concentrates in her violin her 10 years of professional training at the Conservatory of Trieste, where she is currently studying. She is second violin in the orchestra of the conservatory, as well as soloist or first violin in other concerts in Friuli-Venezia Giulia and Veneto. In addition to the violin, she expresses her versatility through her vocal ability, with which she has performed in several concerts in Italy and abroad. Her warm and full-bodied voice was chosen as backup vocalist for singer Nek, in Spain. Furthermore, through her training at the conservatory she began to study other instruments, like the guitar and the piano. She is a 360 degree musician, who found a powerful way to express her passionate and expressive nature in the energy of Uttern. Her personal journey leaves no room for conditioning by any dogma or doctrine. Despite being raised in a Catholic context, her rationality and spirituality are linked exclusively to an inner feeling, which led her to a deep listening, intimately connected with Nature. Giovanna is the fire element of Uttern, a lively mind full of passions, with a strong, joyful and sunny personality. As a child, Sybell, the Uttern guitarist, started to show an immense love for reading and knowledge, driven by an atavistic curiosity for other wordly spiritual knowledge and the small and large worlds of biology, zoology and computer science (as a matter of fact, she comes from a family of science teachers). In the beginning of her adolescent years, she developed a love for literature and the study of ancient languages ​​(Nordic and Celtic) and mythology (Celtic, Nordic and Native American). She is attracted to history, with a particular fondness for the history of the Mesopotamian, European and American people. Her introverted personality has always made her reflexive in her relationship with the world and made her develop into a sensitive little girl; but around age 16 she had a breakthrough. She began to open up and express herself by writing poems and learning to play electric guitar. Immediately her creativity spilled into her songs, which were influenced by many genres, and over the years it brought her to create her solo project “Sybell”. Meanwhile, she graduated with a degree in philosophy at the University of Udine while she continued her musical studies, attending MMI of Treviso and then passing the second level examination at the Lizard in Fiesole. Later, discovering the limits of an excessively scientific and rational mentality, and she moved her interests towards psychology, the study of Eastern religions and the ancient spirituality of Europe. She then began to travel and see the world with different eyes. In 2015 she obtained a diploma in electric guitar from the Rockschool. Currently, she teaches guitar, which she considers a true vocation. After joining Uttern, she immediately created a very strong bond with the other musicians. She shared important spiritual experiences with them, which strengthened many beliefs she had previously held. She is very happy to be part of this family and she hopes with all her heart to be able to bring a spiritual and human liberation message throughout the world. Serena Durí was born from musician parents and since she feels drums are her way. Formed at the conservatory J. Tomadini of Udine and graduated at the Conservatorio G.Tartini of Trieste but continues to discover sounds ranging from exotic to innovative thanks to numerous seminars and masterclass drums by Christiano Rocha, Dennis Chambers, Giorgio Di Tullio, Camillo Colleluori, Simon Phillips Horatio Hernandez and André Araujo (Brazil) Uirá Kuhlmann (Brazil). After playing with numerous orchestral formations, in March 2017 he knows the Uttern and joins the group; she feels immediately involved and comfortable with them as they are sisters. They tell you about a sacred nature that you already know when it climbs on the peaks and the relationship with the mountain becomes a moment of meditation and deep connection for her. She is a zen spirit, attracted by the deep meaning of things. Look for the heart and simplicity of anyone in front of him and this makes it even easier to get in touch, both human and rhythmic between his instrument, drum, and shamanic drums.